Leap Day - What Leap Day? I've long been a fan of HP (and hated some of their products and policies as well) but I'm gratified to hear Ms Whitman is able to see where they need to go. Hopefully this will undo the mess that started way back with Princess Carly. HP CHIEF Meg Whitman has revealed her intentions to establish WebOS as a credible competitor to Apple's IOS and Google's Android, and reassert the firm as an innovator through doubling its R&D spend. At HP's Global Partner Conference in Las Vegas today, Meg Whitman gave a rallying cry to her staff, customers and partners, setting out clear and decisive plans for every aspect of the company. A major part of the strategy is to refocus the firm on invention and innovation. Whitman said that HP Labs had been underutilised over the past few years, and needs to become more focused on business and sales. "I want to get them from incredible idea to commercialisation faster," she said. "We're doubling down on our R&D spend in every division in this company." Whitman dropped several less than subtle hints about her thoughts on previous management at the firm. "We have to do a better job of organic innovation," she said. "That's the way we should be able to invest, and that's how we will." Wow. What was I thinking. Time to get back in the saddle. I think if I commit myself to once a week I can post something meaningful. Right now includes setting up a large MySQL database. Using HeidiSQL. Table defines are super easy. Data imports from CSV files are good with the exception that if it chokes on a bad data field the whole process stops. If you're loading 40k records that can be a pain to go back and fix the bad data to get a successful load. I need to find the work around. I've had some serious slowdowns occurring on my computer and had one hell of a time trying to figure it out. I would bring up the task manager (ctl/alt/del) and sort the processes by CPU time with highest on top (click the cpu column heading twice). It became obvious the FireFox was really eating up 100% of the cycles. Here you can see what happened as soon as I closed FireFox. Some web searching provided nothing useful except to show several people have had this problem. I disabled some of my addons I really didn't need. Each time I started FF the problem came back. I tried starting FF in safe mode but it still happened. Now I was allowing all my tabs to be restored each time. I had roughly twenty open. I left task manager up and started closing tabs slowly, watching the CPU usage. Turns out it was one site, SFGate. I had left a story open I was interested in. Doesn't matter what I do, anytime I have a SFGate page open it happens. Now I have some ad blockers and no script installed but it seems that might not be it. After all it still happens when I tried safe mode which disables all blockers. I also tried Chrome, IE8 and Opera with the SFGate home page. 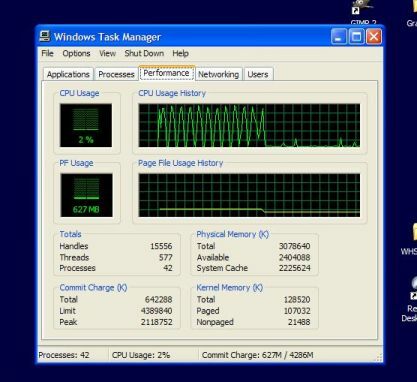 Each showed an initial sharp spike in task manager but then settled down. Opera showed a somewhat higher usage with up and down spiking at around 20-25%. Interesting and I'll still keep using FF as my default browser since I like it and am used to it. It should be interesting if I find any other pages with this happening. The underlying cause remains a mystery. TDL3 rootkit. A very hard one to identify. I've had two different computers at completely different locations experience this. The big clue is redirection of search results. Even Google on FireFox. You get the results but if you try to link it redirects. I have no clue as to the vector. AVG, Hijack This, Housecall and Malwarebytes all failed to find it. Combofix could see it but failed to fix it. Kasperskey has a specific cleanup tool that did the job. Even for me this is a little too stupid. A $3600 TV.